Stephen Williams blogs as Ravensbolt. He publishes his art under the Ravensart label whilst he also works as a Chartered Accountant running his own firm, Ravensbolt Limited. He has no formal art training and instead sees art as just one of many paths to follow. He has written a book entitled "All-in", charting his journey as poker player from micro-stakes, on-line games to national tournament player. He also has a degree in Civil Engineering but gave this up soon after University to become a Chartered Accountant. Later, he took a second degree in History at Birkbeck College, University of London, and he is currently working on a novel centred around the East India Company in the Eighteenth Century. Ravensart is dedicated to his art work which was developed from a surfeit of time and imagination in many long, tedious, corporate meetings. In these meeting he created a bunch of doodles, shapes and creatures which he saved and later worked on to create many of the paintings you see here today. He has combined his abstract view of the world with a fondness for bold, striking lines and colours to create a style which he has labelled 'Doodle Art' or 'Blackline Art'. 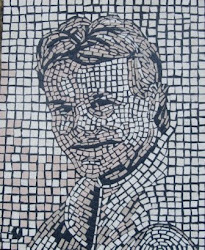 A branch of this artistic style led him to start experimenting in mosaics, another medium in which strong, bold lines are central to the composition. There isn't an underlying theme to his art. However, his approach mirrors his approach to life and revolves around freedom, vision and thought. Freedom from the state, from religion and from tyranny. The freedom to think and to be and not to be bound by politically correct mercenaries. The freedom to see the present and the future for what they are and most of all the freedom to enjoy life without harming others.